This newsletter is brought to you by the Friends of The Frelinghuysen Arboretum and was delivered to your mailbox because you directly subscribed to it or gave your e-mail address as part of your membership registration. If you have changed your mind and wish to unsubscribe, please see the instructions at the bottom of this page. While you may view our full program on the Events Page of our website, we are pleased to highlight these upcoming programs. We know everyone’s schedules are busy, so walk-ins to the speaker programs are welcome. However, early registration will guarantee you a seat and will help us plan. Enjoy this wonderful, family-oriented celebration of gingerbread creativity with your family & friends. Click the Gingerbread Button for all the details. We have had a great turnout of potential exhibitors this year. Our exhibitor list is full for this year's show as is our waiting list. We look forward to possibly working with you for next year's Gingerbread Wonderland Craft Show. If you are a Member of the Friends of The Frelinghuysen Arboretum, don’t forget to register for the Members Night at Gingerbread Wonderland on Thursday, November 29, and get a preview of the show free of charge. After viewing the exhibit, come to the lower level for complimentary refreshments. If you are not a Member, we encourage you to become one by going to our Membership page on our website and joining on line. Then go ahead and register for the Members Night event. Explore through pictures one of the Earth’s unique habitats: an urban wilderness, with Riverkeeper Captain Hugh Carola. The Hackensack River watershed covers a 197-square mile area in northeastern New Jersey and southern New York. It is a place where humans and wildlife have learned to co-exist and flourish. 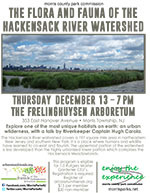 The uppermost portion of the watershed is less developed than the highly urbanized lower portion, which comprises the Hackensack Meadowlands. Don’t miss this rescheduled program on its new date, Thursday, December 13. The program is eligible for 1.0 Rutgers Master Gardener CEU’s. Click the flyer for details and on-line registration. Do you ever wish you could capture the details of a plant long after you’ve seen it? This introductory class teaches you how to make realistic drawings of plants using a variety of techniques. Learn to draw a selection of plant parts, including branches, stems, leaves and flowers, for pleasure or to expand your drawing skills. 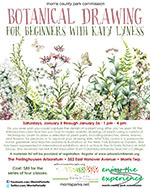 Artist Katy Lyness is a passionate home gardener and teaches botanical illustration at the New York Botanical Garden. She has been represented in international exhibitions and is active in the Tri-State Botanical Artist Group. She received her MA in Art Education from Columbia University Teacher’s College. A materials list will be provided at registration. 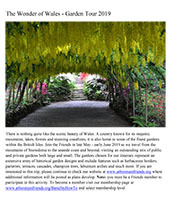 Wales is home to some of the finest gardens in the British Isles and they will be at their best in late May through early June when we will travel there. Click the flyer at right for more information about this great upcoming trip. A complimentary light buffet lunch is provided to all attendees. Following the auction and lunch, observe the regular North East Center orchid judging for an educational and entertaining afternoon. Affiliate member programs are all free and open to the public. When shopping at our fine Retail Partners, please remember to present your Membership card at the beginning of your check out transaction. Our Retail Partners need to enter the discount at the beginning of that process. If you have not yet used this wonderful Member Benefit, you can view our full list of Retail Partners by clicking here. Don't forget to "SMILE! "Amazon Smile, that is! Amazon, through the AmazonSmile Foundation will contribute 0.5% of your purchases on Amazon to a charitable organization you select. Please consider selecting The Friends of the Frelinghuysen Arboretum as your designated recipient from this wonderful program. Click here and log in to your amazon account to designate the Friends as your charity. All our events can be found on our Events Page where, we are happy to say, you can register and pay on line -- just click on the "Add to Cart" buttons on our Events page and Membership page. Alternatively, you may register by calling 973-326-7603. That's it for this time. Hope you enjoyed this edition of the newsletter. Tell your friends about this handy way to keep up with activities at the Frelinghuysen Arboretum (click here for complete directions for subscribing. Email your comments or suggestions to webmaster@arboretumfriends.org. Phone us at (973) 326-7603.